Houston, Texas, September 22, 2016	(Newswire.com) - ​​​This week, CellPhoneSignalBooster.us is highlighting their most recent RV cell phone signal booster for RVs and motor homes. “With the growing number of individuals taking to the roadways full time, the RV booster is a necessity for the recreational vehicles market/industry,” said a CellPhoneSignalBooster representative. By offering an affordable kit that targets and maximizes weak signals to usable levels, the RV operator can effectively use his or her cell phone with minimal risk of dropped calls. The RV cell phone signal booster is a solution to the problem that many vehicle operators face. When in a larger sized vehicle, such as an RV, the signal strength of cellphones is generally weakened. Sometimes this is due to the construction of the RV and the electronics therein, but the weak signal can also be the result of traveling to places that are outside of the urban network. 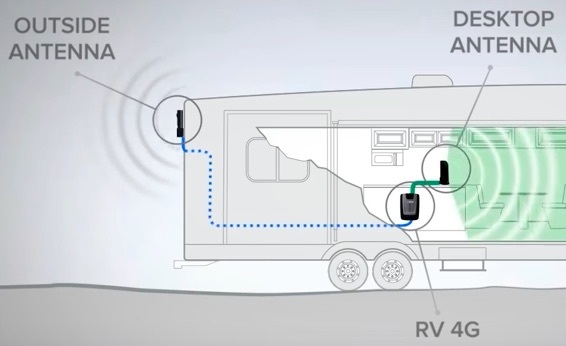 Utilizing the RV booster allows for the cell phone user to have the ability to make calls, upload data, and stream content without the tiresome dropped calls, lost data, or interruptions to streaming. In addition to the mobile functionality of the RV cellphone signal booster, if an omni directional antenna is used, the booster also acts as a stationary booster for times when the RV is parked at campgrounds and other travel destinations. In many cases, the rural areas (even though they may be popular tourist attractions) have a weak signal, especially in locations where a cell phone tower cannot be constructed due to the nature of an area (such as in wildlife preserves and national forests). Because the booster works off of signals which are present in about every location, albeit, “weak”, the RV booster can help increase signal strength. An amplifier in the kit accomplishes this by taking the small signals outside, and amplifying them into one strong signal. This signal is then relayed to the interior desktop antenna and projected to the cell phone equipment such as phones, tablets, and mobile hotspot devices. While the cell phone signal booster does not replace the need for a cell phone service provider, it does maximize the coverage and strength of the signal. The kit is guaranteed to boost voice & data capabilities on 3G and 4G LTE phones of practically all cell phones and service providers within United States and Canada. For United States, this means that AT&T, Verizon Wireless, Spring, and T-Mobile are covered. In Canada - Rogers Wireless, Telus Mobility, and Bell are under the guarantee. As most cell phones are covered and compatible with the RV kit, any driver in the United States and/or Canada can use his or her existing cell phone equipment with the device. Expounding upon why a cell phone signal booster is needed for an RV, a booster provides not only the means to use a cell phone for emergency calls, leisure communications with family and friends back home, and communications for work related trips, but that the cell phone signal also improves Internet browsing experience with faster uploads and downloads of web pages. It includes all of the installation parts required (minus the tools such as a screwdriver) to easily mount an exterior antenna and other components. Included with the installation parts is an easy to follow step-by-step guide. This allows for the purchaser to conduct the installation quickly and easily without the need of a professional automotive technician. CellPhoneSignalBooster.us is owned and operated by Accessory Fulfillment Center, LLC, located in Houston, Texas, USA. They are one of the nation’s leaders in the sale of high quality signal boosters (such as this one discussed in this press release) that are manufactured with pride in USA.